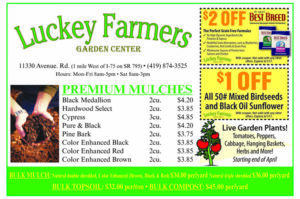 Luckey Farmers Lawn and Garden Center May Deals!! Special Savings on Bagged Mulch, Bulk Mulch, Bulk Topsoil, and Bulk Compost. Plus Live Garden Plants Tomatoes, Peppers, Cabbage, Hanging Baskets, Herbs and More. Click Here or on Image For a Printable View of this Flyer.